It’s actually one of Phil’s WW2 history reference books, and as today is a work day for me I’m doing one of the Scavenger hunt pictures, which is~ #14 A book in a different language to yours. I don’t speak, read or understand Czechoslovakian (and neither does Phil 😀 ) so this fits the bill nicely. Ground Operations of the Axis & Allied Forces. Apparently. 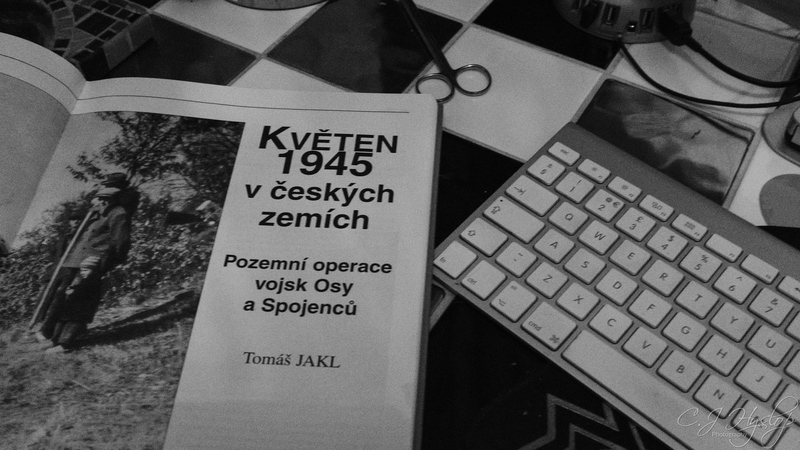 Posted in 365, B&W, books, Fuji X100F, PhotographyTagged 365, 365 project, April2019, Black&white, book, Czechoslovakia, day105, Fraggle, Fujifilm X100F, PhotographyBookmark the permalink. I must ask Gosia, most of the Slavic languages have a common thread. ‘April 1945’ that bit is for sure, then its something about the tactics of the army possibly in a specific battle. One day I will take a picture of Phil’s bookshelves, actually it’d take more than one shot, they are legion! Well if you got notified I reckon we’re wearing them down 🤣 go us! Haha ok your wish is my command, tomorrow’s shots will be a hubbies bookfest!